'Smell The Colour of The Rainbow' explores a multi-sensory step over the rainbow with a twist of wonder. Building on Dr Tillotson's heritage in 19th century printing, soap and lifestyle, a new 21st century body media will be introduced as a "scentsory" platform, using computerized scent-output systems worn on the body for fashion, wellbeing and health applications. The seven colours of the rainbow partner with therapeutic aromas to bring the body into a state of wellbeing and balance. Technology and responsive fashion merge with natural fragrances using the therapeutic power of essential oils, supported by the latest research in 'Aromachology', to reflect the colours of the rainbow, enhancing mood and improving lifestyle. The rainbow offers a fully personalized, controllable ‘scent bubble’ that is activated by the user alone from high-tech jewellery and clothing. These can be programmed to deliver a palette of fragrances, depending on emotion, mood, occasion and time of day, whilst complementing the audio/visual senses. If combined with biometric sensors that measure stress indicators, soothing scents could be released whenever the stress levels exceed a certain threshold. Similarly, refreshing and revitalising scents can be used to fight fatigue and boost self-esteem. Using colour in conjunction with therapeutic fragrances, gives the wearer a visual aid to alleviating their physiological and emotional state. 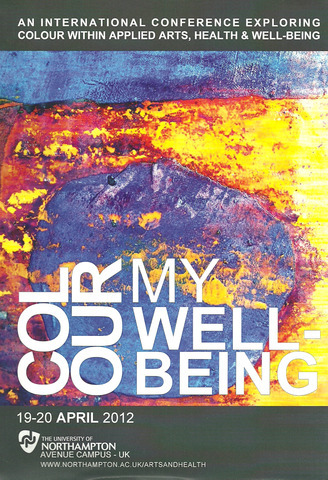 Emerging technologies, 21st century design features and the healing powers of nature combine to produce a fundamentally simple concept of creating a positive personal space on this highly charged 21st century planet we all share. 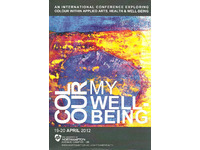 An International conference which explored colour within Applied Arts, Health & Well-being, in association with the Journal of Applied Arts & Health (Intellect Ltd) and The University of Northampton. Over two days artists, health professionals, designers and academics from around the world gathered at The University of Northampton to explore developments in the way colour is used for health and well-being. COLOUR my well-being was a conference focused on the interactive relationships of Arts and Health and was of particular interest to researchers and practitioners, allied health professionals, creative, alternative and complimentary therapists, mental health community, people working in health and social care, creative media, design, fashion, education, theatre, environmental specialists and architects, sound and light installations, Seasonal affective disorder (SAD) treatments, occupational therapy applications, synaesthesia, dyslexia, colour vision deficiency, spiritual & paranormal – mandalas and the sub-conscious, aura photography/video - to name but a few.